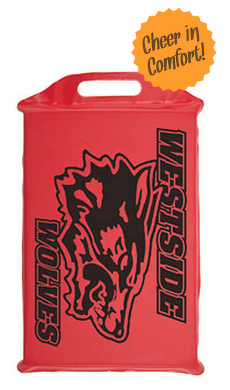 Seat cushions come in the shape of a team jersey and made of soft closed cell foam rubber perfect for outdoor sporting events, football, baseball, hockey, etc. These custom seat cushions are perfect for all your events and never worry about having a comfortable place to sit again! Imprint your creative artwork and text on these high quality cushions. Available in bright color foam for value. Ideal product for charitable marketing, employee giveaways, or client gifts. Cushion is approx 3/4" thick, available in many different colors and made with our closed cell foam material.